Sorry ! ignore my entry under Rifleman , sent in error. One suggestion would be the other websites where this has been addressed before. Two I would start with are the Napoleon Series and TMP and just search for reading lists. "Tactics and the Experience of Battle in the Age of Napoleon" - Rory Muir. A bit anglo-centric but nevertheless very good. "The Battle Tactics of Napoleon and his Enemies" - Brent Nosworthy. An in-depth look at not just Napoleonic tactics but how they evolved from the tactis of the 18th Century. Can be a bit heavy in spots - this is a proper academic treatment of the subject - but excellent all the same. "1815 - The Waterloo Campaign: The German Victory" - Peter Hofschroer (2 volumes). In-depth examination of the German contribution to the Waterloo campaign. Not very flattering to Wellington. "The Campaigns of Napoleon" - David Chandler. A real classic. Some of the information is said to be out-of date, but it's nevertheless a good starting point and very comprehensive. The title is indicative of the contents, though, which means there isn't much about Spain. An excellent companion volume to Chandler . Well-written and with exquisite maps. Pricey but worth it. An in-depth look at the tactics of the time. More granular than Muir or Nosworthy, I think. That's just an observation, of course - not a value judgement. Includes a very interesting transcript of some of Ney's writings on the subject of grand tactics. Before reading this I had never imagined him to be so tactically sophisticated. "The Battle" - Alessandro Barbero. A real gem of a paperback. If "Gettysburg" is the best movie made about a battle (IMO), this must surely be a candidate for the best-written book about one. Without a doubt the most masterfully-crafted history of Waterloo that I've ever read - and I've read a few. How to learn about history without feeling like you're learning at all. A bonus too to have another account of Waterloo that's not written by an Englishman. Mark Adkin's beautiful "Waterloo Companion" complements it superbly. Like the title says, data: lots of it and in a fairly raw format. Details of every battle you've ever heard of between 1792 and 1815 and hundreds you haven't. Gives commanders, strengths, orders of battle (level of detail here can be variable). An excellent resource for the scenario designer. Not a good source of historical narrative though. This is a must for anyone who wants to really understand what happened on a battle field in the napoleonic era. Imho, there are far better websites that can help the "newbie" on his first journey in the years of Napoleon than this "classic". Half of the tactics and ideas behind Chandler's writing are not merely outdated, but simply wrong. This was (like for many out there) my first nappy book, and it took me years to correct the wrong informations that I learned from it. From the best italian historian at the moment, one of the best books about a napoleonic battle. Similar, Gioannini/Massobrio's "Marengo". Lieutenant Franz von G., Cmdr. of the Lègion du Midi, 15th Division, IV Corps, Grande Armée. Re : Re : Re : Reading Recommendations for Napoleonic Campaigns and Warfare ? That's a good point, and I hadn't thought of it like that. By the time I obtained this book I'd already read several others, so that I automatically disregarded anything I found to be dubious. My only observation about Barbero's book that come seven remotely close to a complaint is that I wish he'd covered Ligny, Quatre Bras and Wavre too. The French Revolutionary Wars, 1787-1802 by T. C. W. Blanning, haven't read it myself. The French Revolutionary Wars by Gregory Fremont-Barnes, just scratches the surface as most Ospreys. The Road to Rivoli by Martin Boycott-Brown. The Art of War of Revolutionary France by Paddy Griffith, focuses on the French revolutionary war machine rather than the campaigns itself. Eagles over the Alps by Christopher Duffy. Marengo and Hohenlinden by James R. Arnold. Several books to choose from, 1805: Austerlitz - Napoleon and the Destruction of the Third Coalition by Robert Goetz would be the most popular afaik. Napoleon's Conquest of Prussia, 1806 by Francis Loraine Petre. Napoleon's Campaign in Poland, 1806-1807 by F. Loraine Petre. Crisis in the Snows by James R. Arnold. 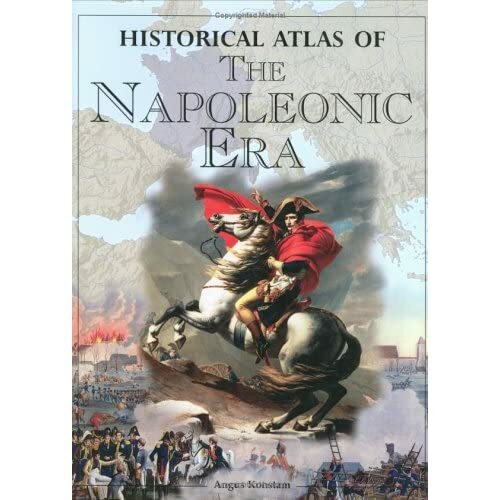 Napoleon’s Triumph by James R. Arnold (will be released in 2010). The Thunder on the Danube books by John H. Gill, the last Volume will be released in March 2010 afaik. I have only read German books on the campaign so far, dunno which English book is the most popular here. The Fall of Napoleon by Michael V. Leggiere, don't know when the 2. Volume will be released. I don't really have a overview over the available books here, only read 'The Battle' and the Waterloo Companion so far. Peninsular War: A New History by Charles Esdaile are the most popular afaik. Several books to choose from, have only read Amateurs to Arms by Elting so far. Soldiers, Sugar and Seapower by Michael Duffy. There are several books about the Haitian Revolution. I like the eye-witness accounts, whilst sometimes subjective or jingoistic they nonetheless convey the spirit of the time very effectively. I especially liked the memoirs of Captain Coignet & Sir Harry Smith. The site also has links to other resources. Napolèon 20 ans de campagnes ed: Arthaud Paris 1964.. Many thanks to all that replied to my request. Armed with the large selection given plus the purchase of HG and add ons in future (Peninsular War ) I have enough to keep me going for Birthdays ,Fathers Days, Christmas for several years to come. I just wish that my pension were large enough to cover them all in one go ! Pardon my ignorance but what about Cahndler's book is wrong or is there somewhere that has a outline of his errors? Not sure if these have already been mentioned, but I would certainly recommend them: Scott Bowden's The Glory Years: Napoleon and Austerlitz, and the works of George Nafziger on 1812, and his trilogy on the 1813 campaign.